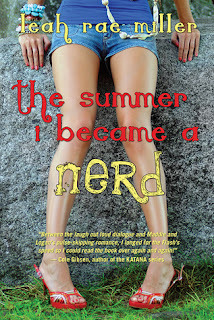 The Summer I Became a Nerd is the first book I featured on my WoW. Seeing the word "nerd" in the title completely drew me in. I just knew I was going to love it. I just knew. There was never a moment while reading the book where I felt like my expectations were not met. I hate it when a book is supposed to be filled with geekiness but it doesn't go all out. This book did not disappoint me; the overall geekiness was an 11 over 10! How geeky is this book? As in comic book-sniffing geeky. As in Live-Action Role Playing (LARP) geeky. Uh huh. While I had a slightly hard time trying to grasp the concept of LARP (which my brother was very happy to explain to me... I live with a geek. ), it didn't bother me one bit. It's the first Young Adult book I've read that completely celebrates nerdom. All the geekiness made the story cuter and added to its charm. I liked how Maddie, the main character, was written. She's a big nerd inside but she strives to stay popular 24/7. At times it was frustrating how Maddie would do anything to keep her status. Sometimes she just seemed shallow but when she brought out the nerd, I'd forget about it. She's just too cute! I especially loved Maddie's obsession with comic books because you can see how much of a nerd she really is with the way she described the comics she reads - how it felt in her hands, how vibrant the illustrations were and even how they smelled. I don't know if it's just the nerd in me but Maddie was a very relatable character all throughout. She may have had issues but let's face it: she was going through a common struggle in high school. And I think the author did a really great job at presenting it through the eyes of one very lovable and spunky Maddie Summers. Aside from the insane dorkfest that went on, readers will certainly fall in love with the very adorkable Logan. Unlike most of the nerdy guys I read about in books, Logan is not wound up, he's not a loner, he's not clueless about girls. Sure he's not so smooth all the time but at least he's not too nerdy to function. He's funny, easy-going and incredibly swoon-worthy. I loved how he put on "the moves" without Maddie even realizing it. There were just these "moments" that were happening between them even before they recognized it and I think that's exactly what made me love their story even more. I got the feels I always look for in love stories and it's all because of how adorkable Logan was and even more adorkable when he's with Maddie. This book is so fan-freaking-tastic that it gave me a hangover. Deep down I know I'll always be craving for more of Mattie and Logan and all their nerdiness combined. I want more. It's been days since I've read it and I still want more. The Summer I Became a Nerd is instantly one of my favorite books this year. It has a great set of characters, lots of nerdiness, a lesson every teen should learn and a love story that made my heart jump for joy plenty of times. I don't see myself getting over this hangover inducing book any time soon. Mother, wife, and YA author living on a windy hill in Natchitoches, Louisiana. I love fuzzy socks, comic books, cherry coke, and brand new office supplies. 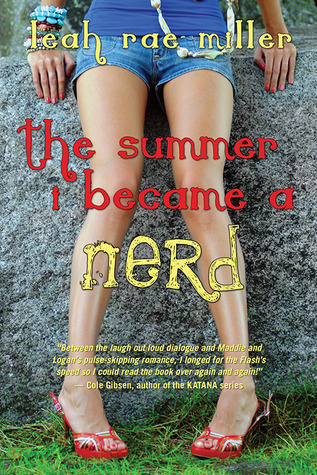 THE SUMMER I BECAME A NERD coming Summer 2013 from Entangled Teen. Stay cool! Eeeeppp, five stars from you and Kazhy! Now I need to get my hands on this. Thanks for the review, Sab! Get it!!! Yes! Too much kilig. Haha! Right now I am exactly in the mood for a fun, light read, so I think I'll be reading this one very soon!! I need this book in my hands! It sounds so amazing and I've featured it as one of my WoWs as well. I just haven't gotten around to buying it yet! This was a great review and I'm stoked that they even have LARPing in it! "Nerd" or "geek" in a title totally makes me want to read the book as well! Glad you love this because some didn't so I think I'll just go see it for myself!